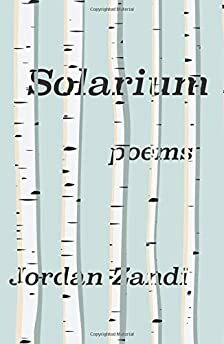 Largehearted Boy: Book Notes - Jordan Zandi "Solarium"
Book Notes - Jordan Zandi "Solarium"
Jordan Zandi's poetry collection Solarium brilliantly explores the themes of youth and memory. "A first book made eventful by the weirdness and clarity of Zandi's mind. Poetry is like solitaire: we go to it to pass the time. Zandi reminds us that passing the time is a very serious activity. His balletic inner life belies the gravity at its core." My recently published book of poems is an exploration of youth and memory in which the speaker's interiority and exteriority collapse into dreamlike encounters with past and present. Although I don't listen to music while writing (it covers up that inner voice) music has always been important to me for regulating and establishing moods, and I'm one of those people who loves listening to songs repetitively, sometimes for hours. When I listen to a song over and over, preferably while driving large stretches of highway through the Midwest, song lures me into a kind of trance, and my mind drops into playback mode through the associative past. 1. Kate Bush – "Cloudbusting"
No matter what the sound track is for, Kate Bush is probably going to end up with a song at the top of any track list I make; and "Cloudbusting," aside from being my favorite song she's ever written, had a small role to play in Solarium. The lyrics of the song are based on Peter Reich's A Book of Dreams, wherein he recounts various childhood memories with his father, the renowned psychoanalyst Wilhelm Reich, who descended into madness after founding the research campus Orgonon in Maine. The sense of yearning, ache, and loss that suffuses Reich's journey into memory felt akin to my own work of the time, and the epigraph for Section II of Solarium comes from this book, which I would never have learned of if not for "Cloudbusting." The Legend of Zelda series has given video gamers numerous memorable sound tracks over the past three decades, but I've decided to include the one song continuous throughout as a stand-in for many: The original theme. The Legend of Zelda (along with several other well-known games such as Super Mario Brothers) was created by Shigeru Miyamoto back in the 1980s, and Nintendo is still rolling new installments out today. It's the very first video game I can remember seeing, and I watched both my father and grandfather play it before falling head-over-heels myself. Miyamoto has said the concept for the games goes back to his own childhood experiences growing up among the woods, lakes and caves around Kyoto and that he wanted to capture this sense of adventure in a video game. In one interview he says, "When I was a child, I went hiking and found a lake. It was quite a surprise for me to stumble upon it. When I traveled around the country without a map, trying to find my way, stumbling on amazing things as I went, I realized how it felt to go on an adventure..."
Mellon Collie and the Infinite Sadness was probably the first decent music I listened to growing up, and it marked a distinct transition for me from the horrifying days of Ace of Base and Blues Traveler. The weirdness, scope, and variation throughout this album is still remarkable. There are the singles everyone knows like "Bullet with Butterfly Wings" and "1979," a long psychic journey in "Porcelina of the Vast Oceans," and delightful low-stakes adjacencies like "We Only Come Out at Night." This album did better than teach me: it internalized in me a long emotional arc; and also the idea that smaller, slighter pieces can come together with larger ones in the interest of a greater overall sum movement. 4. Miike Snow – "Cult Logic"
I said I never write with music playing, but this one time I did. The whole time I was writing the poem "Le Monde Familier" I was listening to "Cult Logic" and occasionally looking at the accompanying sunset shot on YouTube with its scattering black sea-birds, oversized moon and breezy-headed palm trees. I hadn't written anything in months, and I needed a change, something to keep my mind off the fact of (not) writing. The poem I ended up with is, appropriately, a temenos, a place dedicated as a sanctuary or refuge. 5. King Crimson – "21st Century Schizoid Man"
The name of this song was once the title of the poem "Chamber Music," which I later found far too declarative for my taste. However, the poem started as a response to a given exercise, and one part of it was to choose a title that was a piece of music; so I started there. The full exercise (if I'm remembering it correctly) was: Write a sequence in five sections that contains a storm, a musical instrument, and a memory, and the title must be a piece of music. 6. FKA Twigs – "In Time" or "Two Weeks"
FKA Twigs started her career out as a dancer, and what I like best about her music is the sense of motion the songs carry; and many of them, particularly "Two Weeks" and "In Time," give me sudden transport into movement, as if I'm rowing, journeying, flying. I've also got a soft spot for anyone who grew up in the country and later found his or her way into the art-life of the city. 7. Naughty Boy (feat. Sam Smith) – "La La La"
I like this song, but what makes it stand out for me is the music video, which was filmed in La Paz, Bolivia, where I spent a portion of my fellowship abroad. In it, a young boy runs away from an abusive father and encounters a chow chow dog, a tin miner, and a traffic policeman whose face is hidden behind a burlap mask—a clear reference to the characters of The Wizard of Oz. Together they journey outside the city to confront the demon El Tio. I've never been to a place quite like La Paz, the center of which is nestled in a mountain gorge. The rest of the city extends up the slope and beyond the rim, over 13,000 feet above sea level. Being there in that aerial desert landscape feels like living inside a dream-reality—perhaps in part because your brain is dazed from the lack of oxygen. It was there that I wrote the end of "Solarium." 8. Frontier Ruckus – "Adirondack Amish Holler"
A nostalgic stream-of-consciousness rush through place and memory, this song carries an aching privacy to it ("I have found something that no one else ever touches"). And in lines like "Family don't know that / I've seen the road end / far past the bridges where / salt thaws out to the river" I can't help but see the prodigal's journey out and return. The more effusive moments of emotion that try to reconnect seem only to reiterate isolation and separation, though in the end the singer does seem to enjoy some mild catharsis: rejoining with family; or understanding his or her relationship to the past. And I love that mournful saw in the background. 9. Angelo Badalamenti – "Twin Peaks Theme"
Too young to catch the initial Twin Peaks wave, I was lucky to be introduced to it by a friend in my early 20s. Ostensibly a small town in the rural Northwest, ostensibly a show centering on a murder mystery, in the hands of David Lynch and Mark Frost Twin Peaks becomes a heady, moody alter-reality. Highlights of the show for me include: depictions of the artificiality of small town life (and of performance itself) through intentional over-acting and continuous reference to soap opera; the way places take on identity, becoming characters in their own right (The Double R Diner, The Roadhouse Bar, The Great Northern Hotel); everything that goes on in the Red Room of The Black Lodge. The show's theme song is very simple, yet thanks to long-time Lynch go-to Angelo Badalamenti it evokes so much of the town's dark-yet-optimistic atmosphere. In 2017, Showtime will, after 25 years in abeyance, continue the series—yes, "That gum you like is going to come back in style." I once listened to this song for my entire drive from Kalamazoo, Michigan, to Peru, Indiana, which Google maps now tells me should take two hours and 30 minutes without traffic. I love the combination of Newsom's haywire and child-like voice, harpsichord, sudden swerves, and (sometimes nonsensical) associative lyrics. Also I love the urgent struggle of the self against its lesser half in her songs, as if she's trying to keep her head above water despite all the psychic undertow: "And all those lonely nights down by the river / brought me bread and water (water, in) / but though I tried so hard, my little darling / I couldn't keep the night from coming in." 11. Kate Bush –"An Endless Sky of Honey"
After a long silence Kate Bush came out with the two-disc album Aerial in 2005, and while I love both ‘sides' of the album, the 42-minute track "An Endless Sky of Honey" is a perfect fit for Solarium. The lyrics span a single day, ending with the rising sun the following dawn and the refrain "Up, up on the roof / In the sun." The final movement feels wholly unrooted to the earth, ethereal, as if one were rising into air, journeying elsewhere.